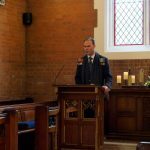 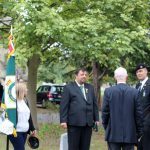 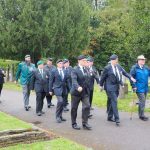 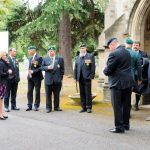 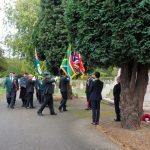 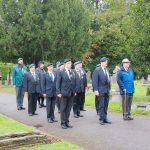 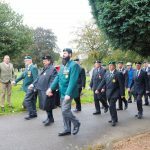 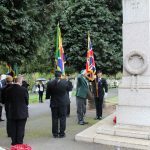 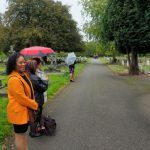 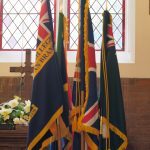 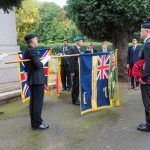 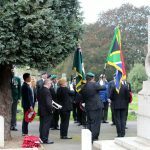 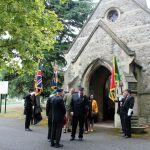 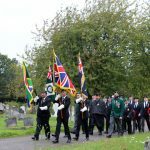 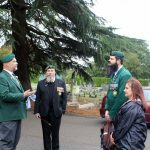 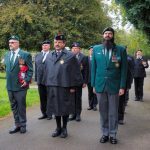 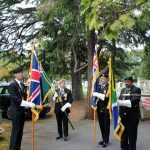 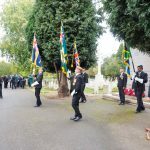 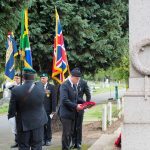 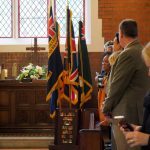 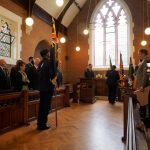 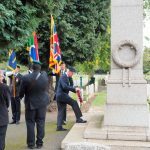 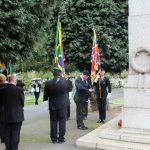 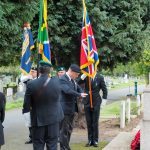 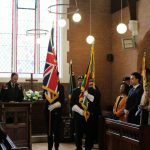 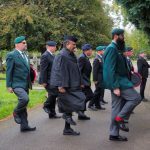 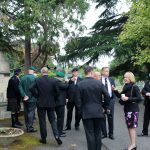 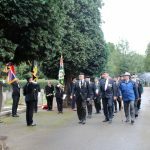 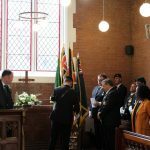 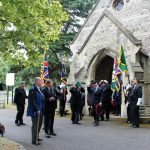 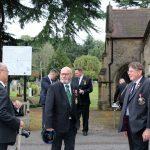 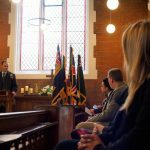 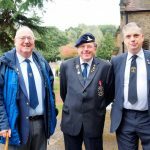 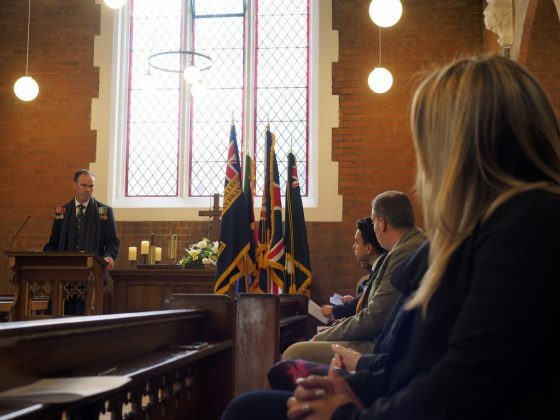 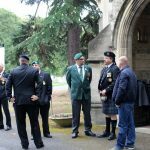 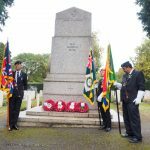 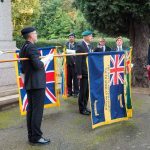 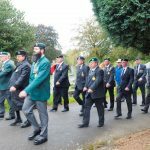 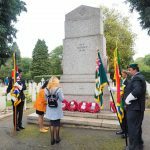 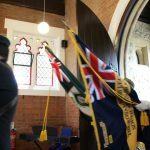 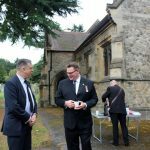 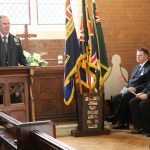 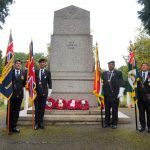 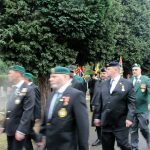 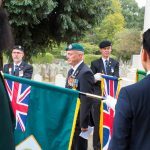 RICHMOND UPON THAMES – The England Branch of the South African Legion hosted a remembrance service and parade to mark the centenary of the Battle of Square Hill at London’s East Sheen Cemetery in Richmond on Saturday, September 22. 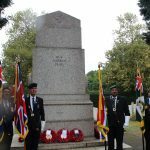 The Battle of Square Hill was fought from September 19 to 21, 1918, when Cape Corps troops engaged with Turkish forces in the final months of the First World War (*see below). 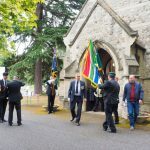 To mark 100 years since this historic battle, representatives of the South African Legion (England, Scotland, and Europe Branches) gathered with representatives of the Royal British Legion (SA Branch), SA Legion South Africa, Royal British Legion (Teddington), and M.O.T.H. 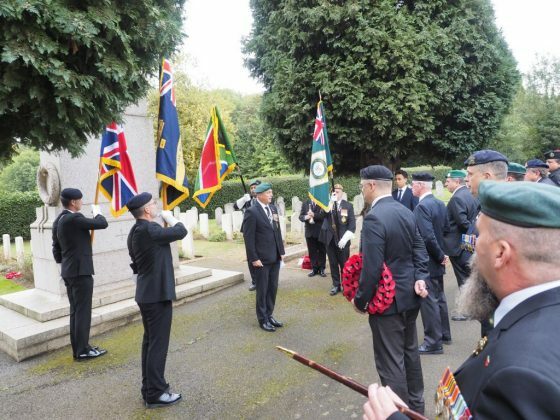 (Gazala Shellhole), as well as several civilian guests – including the granddaughter of one of the fallen and her family – at the East Sheen Cemetery Chapel on the northern outskirts of London’s vast Richmond Cemetery. 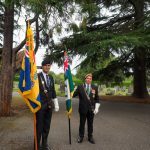 SA Legion Ceremonial Officer Lgr. 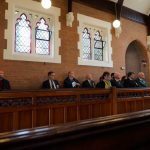 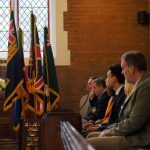 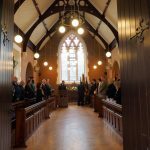 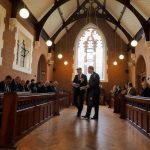 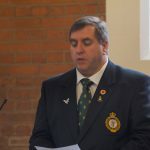 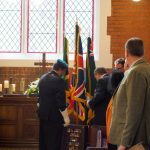 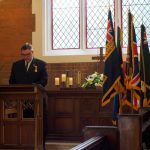 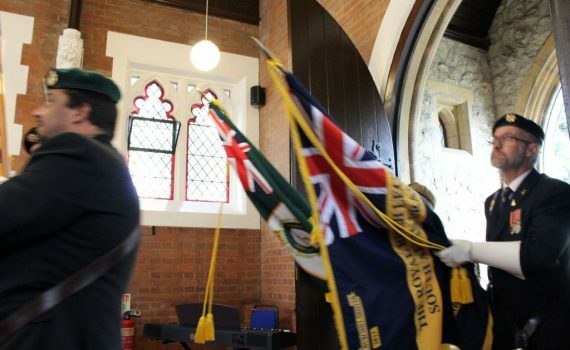 Brian Parry directed the procession of standards into the chapel and SA Legion England Branch Chairman Russel Mattushek recited the Act of Remembrance (They shall grow not old…). 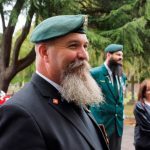 SA Legion Chaplain Lgr. 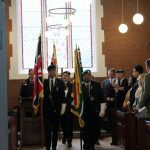 Craig Esterhuizen then led all present in a dignified remembrance service. 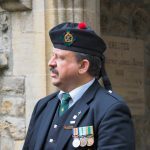 He pointed out the biblical significance of the location of the Battle of Square Hill, which raged in the area north-east of Jerusalem now known as the ‘West Bank’, close to where Joshua laid siege to Jericho, and also to its proximity to Megiddo, referred to in the Bible as Armageddon, prophesied location of a gathering of armies for a battle during the end times. 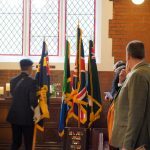 A tribute was also delivered in memory of the late General Johannes Jacobus (Jannie) Geldenhuys who served as Chief of the South African Defence Force between 1985 and 1990 and was Called to Higher Service on 10 September 2018. 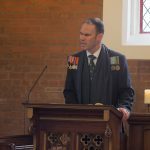 General Geldenhuys was 83. 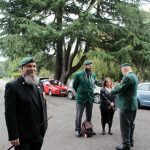 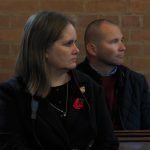 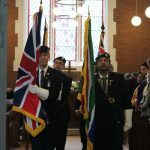 Veterans and gather guests joined in prayers, hymns, and the National Anthems of South Africa and the United Kingdom, after which the standard bearers and the veterans present fell-in to march to the nearby South African cenotaph. 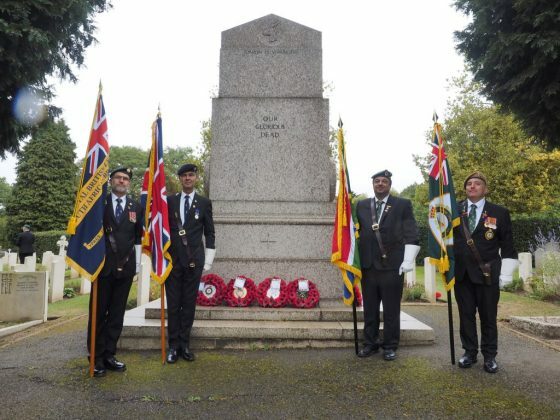 At the cenotaph, the Act of Remembrance was repeated, Last Post sounded, and two minutes’ silence observed. 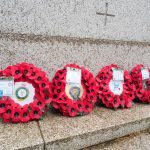 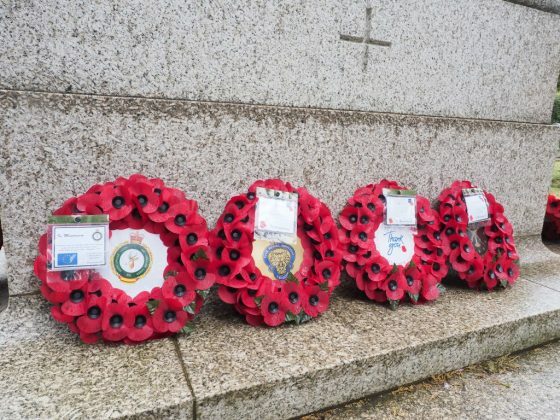 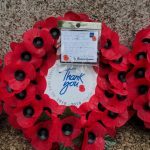 Wreaths were laid on behalf of the SA Legion England, Scotland, and Europe Branches, the Royal British Legion (South Africa Branch) and MOTH (Gazala Shellhole). 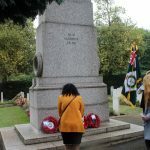 This year marks the milestone centenary of a historic battle which is not yet at the forefront of general consciousness in the United Kingdom. 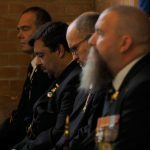 The legion playing its part to raise general awareness. 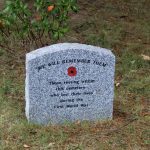 During the Battle of Square Hill in 1918, Cape Corps soldiers were able to shine in their first battle with Turkish soldiers in Palestine during the final months of the First World War. 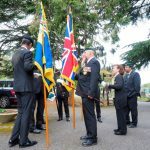 The nightmare that affronted Gen Allenby came in the form of Gen Mustapha Kemal or Ataturk as he was later known (founder of modern Turkey) and Gen Liman von Sanders seconded by the German High Command to their Turkish allies. 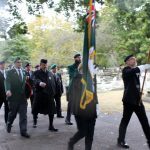 This Turkish/German Army was the same one that had defeated the Australian, New Zealand, and Canadian (ANZAC) forces at Gallipoli, and thereafter marched triumphantly down Asia, conquered Damascus, and overran Syria until they reached the Holy Land. 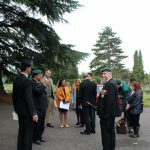 Gen Allenby, with his Staff Officers mused over his problem and formulated their battle plans. 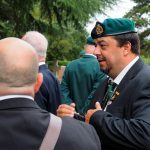 The significance of this battle was General Allenby’s military strategy to connect with Arab allies to the east of the Dead Sea, a mission that was thwarted by the enemy’s control of the Jordan crossing at Jisr ed Damieh. 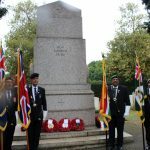 Captain Ivor D Difford, quartermaster of the Cape Corps wrote that Gen Allenby was “determined to strike a blow west of the Jordan, where the whole Turkish army in that area was enclosed”. 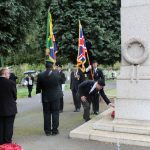 To this end, the plan was to “break through the enemy’s defensive positions and create a gap for the cavalry to pass through”. 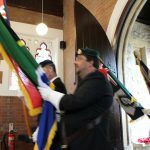 During the night of 18 September 1918 the 1st Cape Corps themselves had taken 181 prisoners. 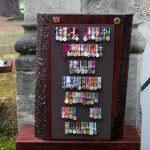 Having come under “fairly persistent counter-attack” they were said to have battled with bayonets in the “strictest silence” and that they carried out orders implicitly. 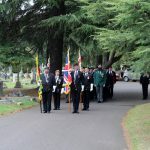 Notable names mentioned in this battle were Lt. Samuelson, Sgt February and L/Cpl Thimm. 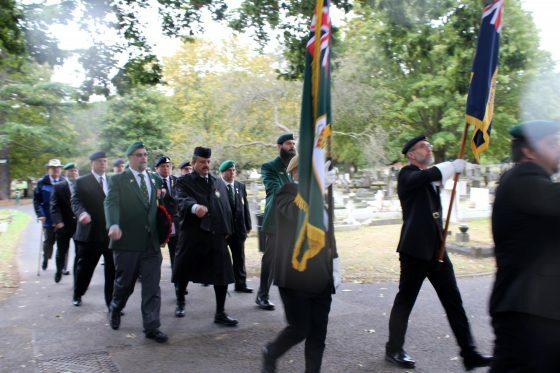 The 1st Cape Corps capturing of the enemy field gun which was noted as “the first gun captured on the Palestine front during Allenby’s great push” – resulted in Lance-Corporal Thimm being promoted to Corporal. 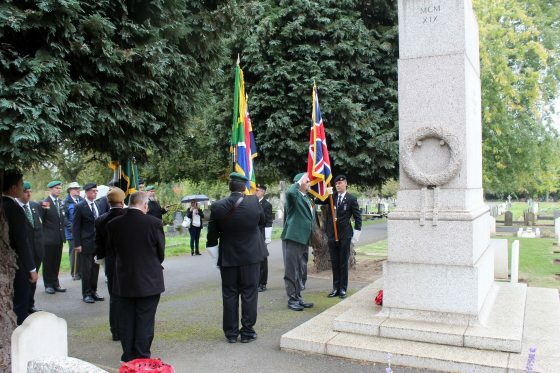 Following the war, a monument was built in Kimberley. 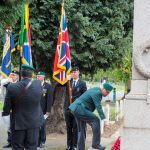 The gun captured at Square Hill stands there still… but of similar monuments in Johannesburg and Cape Town, nothing but promises materialised. 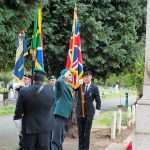 The annual Armistice Day/Remembrance Sunday parade at the Johannesburg cenotaph drew a large crowd of Cape Corps veterans and descendants for decades and was widely known as the Square Hill parade, but even that memory has now faded. 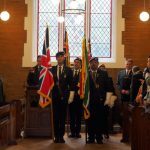 The battle on that night claimed the lives of L/Cpl S Visagie and Pte S Gobey. 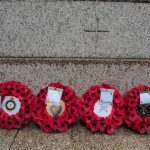 Further casualties the next day were Pte J Jonkers, Pte G Groep and Pte D Hahman. 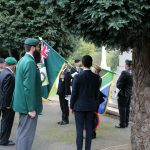 Following the outbreak of the First World War, South Africa, as a British Dominion, formed and mobilised the South African Overseas Expeditionary Force, as its contribution to the war effort. 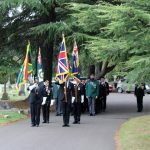 This force consisted of: The SA Infantry Brigade, SA Mounted Brigade, SA heavy Artillery Brigade, SA Field Artillery Regiment, SA Native Labour Corps, SA Field Ambulance unit, SA Corps of Engineers, SA Signals Company, and the SA Medical Corps – a total force of about 232 000, each one of them volunteers. 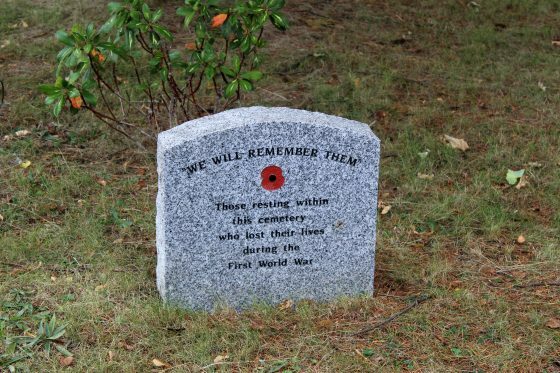 Many of our grandfathers were among them. 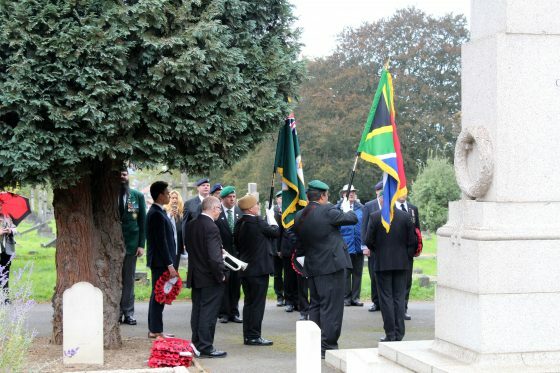 The SA Medical Corps provided the staff for both the South African Military Hospital in Richmond Park London, and the No 1 South African General Hospital established in France. 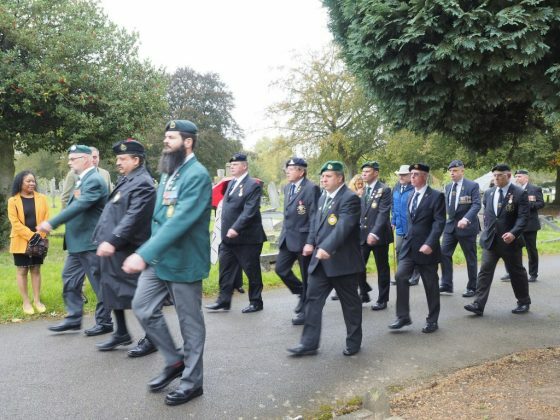 Injured or ill soldiers from all theatres of war were transferred to Richmond for treatment and for recuperation. 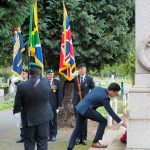 Altogether 39 of the South Africans who died in the SA Richmond Park Hospital were buried in the Richmond Cemetery. 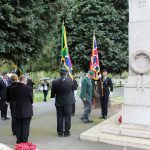 At the end of the First World War, the SA Hospital and the Comforts Fund Committee decided to erect a memorial to these men and to all those South Africans who had died in the war. 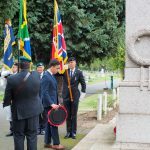 Sir Edwin Lutyens who designed the Whitehall Cenotaph – where thousands of ex-service personnel, including a substantial contingent of South African Legionnaires, march on Remembrance Sunday – designed this memorial and it was unveiled by General Jan Smuts in June 1921. 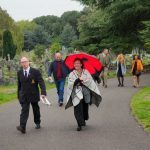 It became a pilgrimage focus in the 1920s and 1930s. 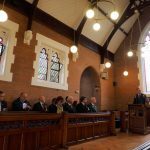 It now has Grade II listed status and it is recorded as a building of special architectural and historic interest.